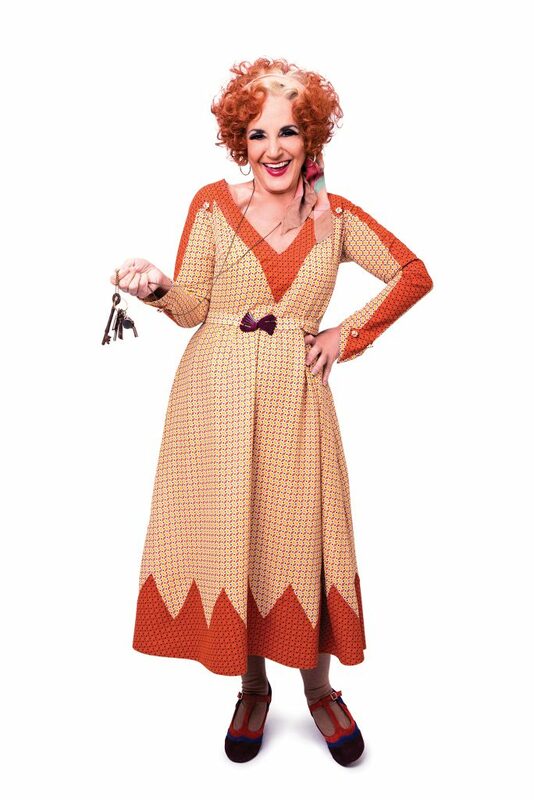 Home About Us News Lesley Joseph to play Miss Hannigan in the musical ANNIE! Lesley Joseph to play Miss Hannigan in the musical ANNIE! Michael Harrison and David Ian are delighted to announce that Lesley Joseph will star as ‘Miss Hannigan’ in their smash hit production of the musical “ANNIE” at Grand Opera House Belfast 29 October – 2 November 2019! Lesley joins Alex Bourne as ‘Oliver Warbucks’, Richard Meek as ‘Rooster’, Jenny Gayner as ‘Lily’ and Carolyn Maitland as ‘Grace Farrell’. The title role of ‘Annie’ is shared by Faye Katsande, Ava Smith and Freya Yates. They are joined by three teams of young performers who play the girls in Miss Hannigan’s orphanage. Lesley Joseph returns to role of ‘Miss Hannigan’ having played the part in this production in 2015/16. Lesley is best known for playing ‘Dorien Green’ in the hugely successful sitcom “Birds of a Feather” alongside Pauline Quirke and Linda Robson. They recorded over 100 episodes over a period of nine years and returned to our screens in 2014 for a further three series. Lesley most recently appeared as ‘Frau Blucher’ in the West End production of the Mel Brooks musical “Young Frankenstein” for which she received an Olivier Award nomination for Best Supporting Actress in a Musical. Her other theatre credits include ‘Miss Hannigan’ in “Annie” at the West End’s Victoria Palace and also on national tour as well as the touring productions of “Calendar Girls” and “Thoroughly Modern Millie”.